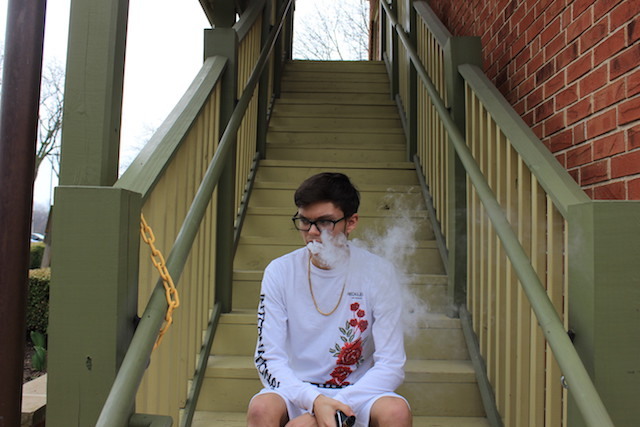 Lindenwood student Seth Cushman takes a vape break on Main Street in St. Charles. When Joe Schnapp gets home from a long day, he “rips” his JUUL. He just wants a buzz, and he hopes that vaping at the end of the day will keep his nicotine tolerance low. According to the results of a Lindenlink poll on Instagram, Schnapp is in the minority of students—60 of the 342 people who responded said they vape. As for how often they partake, respondents gave varied answers. E-cigarettes were first commercialized in China in 2003 then brought to the United States in 2006. The electronic devices heat a liquid and nicotine to produce an aerosol. Most have a battery, a heating element and a place to hold a liquid. Some e-cigarettes look like regular cigarettes; some look like USB flash drives or pens. Across the country, the number of youthful users has doubled, with 1 in 5 high school seniors saying they have vaped in the past 30 days, according to a 2018 study by the New England Journal of Medicine. The U.S. Food and Drug Administration said last month that it was considering pulling pod-based nicotine products off the market as it fights the surge in teen vaping. Schnapp said he thinks the popularity of e-cigarettes has a lot to do with pop culture. Celebrities like Johnny Depp, Katy Perry, the Weeknd and Leonardo DiCaprio have sported vape pens. Alex Hayes, a Lindenwood student and rugby player, said it’s more social for him. He only vapes on the weekends as a way to relieve stress. “It’s just something that helps me let loose for a bit,” he said. 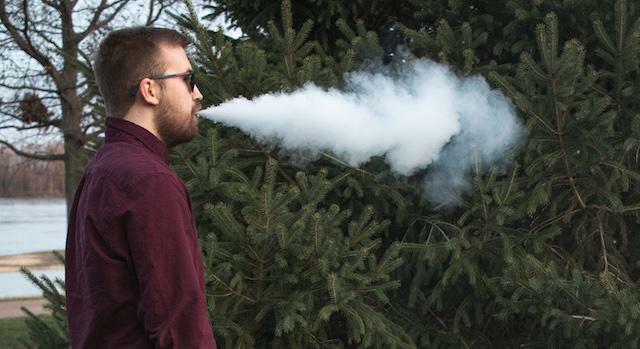 Andrew Zwerlein, a 21-year-old student at St. Charles Community College, said he was attracted to e-cigarettes because they let the user choose the nicotine level, and he hoped to slowly wean off cigarettes. However, vape brands like JUUL only offer fixed nicotine rates that are not able to be altered. Overall, traditional cigarette use among teens and college students is at an all-time low, but vaping may be supplementing the nicotine addiction. According to the National Institute on Drug Abuse, more than 30 percent of e-cigarette users started smoking traditional cigarettes after six months of vaping. Despite the marketing of pods as a healthier alternative to smoking, one pod, which contains the chemicals users smoke, has the same amount of nicotine as about 20 cigarettes, an entire pack. Patricia Cavazos-Rehg, an associate professor of psychiatry at Washington University in St. Louis, has studied the issue and said the effects of nicotine on the developing brain of an teenager can include issues with cognition, memory problems and the risk for mental illness. Another issue, according to Dan Mattheis, an educator for the St. Charles Health Department, are the other dangerous chemicals e-cigarette vapor contains, including diacetyl, formaldehyde, lead and carcinogens. “Diacetyl is a chemical flavoring that has been linked to acute respiratory distress syndrome, a.k.a ‘wet lung disease,’” he said. The long-term health effects of vaping are unknown. Even with these warnings, a 2018 Missouri student survey of St. Charles schools found that 42.4 percent of students, between sixth and 12th grade think there is no risk or a very slight risk in smoking e-cigarettes. Hayes agreed that he thinks there’s nothing wrong with vaping as long as it’s in moderation. Schnapp said no matter what, people are going to have their vices. “I think the medium of that vice has just changed,” he said. The increase in vaping among high schoolers and college students may be due to the way vaping was marketed on social media. JUUL, which came about in 2015, largely used social media to advertise its product, Cavazos-Rehg said. “That was different than how most [e-cigarettes] were being advertised at the time,” she said. Cavazos-Rehg said the problem is that social media isn’t used to properly balance the “pro-vaping” content versus the “anti-vaping” content. “Many of the findings we’ve come across are consistently showing that when substance abuse is posted on social media, it’s largely promotions encouraging substance abuse behaviors,” she said. In answer to the criticism, Kevin Burns, chief executive officer of JUUL Labs, announced in November that it was eliminating its social media accounts and continuing to monitor and remove inappropriate material from third-party accounts. Cavazos-Rehg said regulations prevent tobacco products from offering flavors because they appeal to kids, but she said that these regulations don’t apply to e-cigarettes. “One study found over 7,000 flavors were being marketed online,” she said. Again in answer to the criticism, JUUL announced changes to its retail policy: It no longer provides its flavored pods for sale in more than 90,000 stores that sell its product. The flavored pods are now only for sale on JUUL’s website, where age verification is required and verified by a third party. Cavazos-Rehg said she will continue to be outspoken against e-cigarettes and share her studies on multiple platforms. Tyler Keohane is the Lindenlink handyman. He works on general assignments, photography, video stories, and just about anything else the staff needs help with. When he isn't taking pictures for Lindenlink, he's probably taking pictures for fun. Tyler loves his dog, Rumbo, and cat, Stevie. After graduation, Tyler wants to head to the west coast and continue working as a journalist and photographer.